The glass in your vehicle does more than give you a clear view of the road ahead. Your auto glass protects you from road debris and the sun's rays, acts as a sound barrier, reduces glare, and even serves as a safety device in the event of an accident. 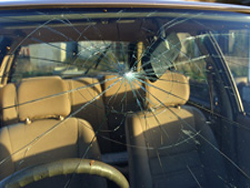 The natural properties of glass are not quite enough to meet auto glass safety specifications. A wealth of scientific knowledge goes into creating each piece of glass and all are formulated differently to provide the best performance in their specific roles. The windshield, for instance, includes several layers of film within multiple layers of laminated glass. One layer helps to protect against the sun's damaging UV rays while the other serves to reduce glare from headlights at night and light reflection from the sun during the day. The second danger in an accident occurs as the passengers "catch up". In an ideal situation, the seat belt restrains the passengers as everything in the vehicle lunges forward. If the occupants are not wearing a seat belt, the windshield will prevent them from being thrown from the vehicle but with the potential of head injuries or other bodily harm.